AS A MAN THINKETH by James Allen. Hear why Denis Waitley described Allen as “the Norman Vincent Peale or Earl Nightingale” of his time; his 1902 classic tells you that you already have what you need to achieve the life of your dreams: your mind. Allen’s empowering words will show you the endless possibilities that await you if you align your thoughts with your goals. THE SCIENCE OF GETTING RICH by Wallace D. Wattles. You deserve to be rich, and this revolutionary primer on prosperity consciousness that has been enriching millions since it was first published in 1910. Wattles takes the mystery out of prosperity and describes the “exact science” of achieving financial success through creative thought. Named one of the all-time best business books by Brian Tracy! ACRES OF DIAMONDS by Dr. Russell H. Conwell. Based on a lecture that pastor Conwell delivered thousands of times, this 1921 bestseller has taught generations that the fortunes we seek are often in our own backyards-if we are willing and able to recognize them. 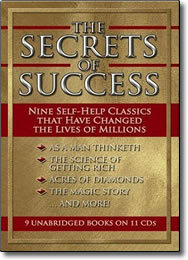 Also named one of Brian Tracy’s all-time best business books! THE MAGIC STORY by Frederic Van Rensselaer Dey. A mysterious fable-within-a-story, this simple tale of one man’s transformation caused a sensation when it was published in Success magazine in 1900; it endures as an inspiring parable of perseverance and possibility that speaks to the seeker and striver in all of us. THE GREATEST THING IN THE WORLD by Henry Drummond. A Scottish evangelist in the late 19th century, Drummond is best remembered for this 1880 meditation on the empowering message of Corinthians, as timeless as it is life-affirming. A MESSAGE TO GARCIA by Elbert Hubbard. From a foreign correspondent and positive-thinking pioneer, this 1899 parable of wartime heroism imparts a powerful lesson on the benefits of taking initiative and responsibility in work and in life. THE MAJESTY OF CALMNESS by William George Jordan. First published in 1900, this meditation on the importance of mindfulness and stress management may sound ahead of its time, but the need to slow down is eternal. CHARACTER BUILDING THOUGHT POWER by Ralph Waldo Trine. A landmark in the New Thought movement that spawned much of the 20th century’s self-help writing, this 1899 classic inspires us to create the healthy habits we need to develop the effective character we want. Life-changing wisdom never goes out of style! These eight classic works have truly stood the test of time, selling tens of millions of copies and remaining in constant demand; now this one-of-a-kind anthology of achievement, reveals why they are every bit as inspiring as they were a century ago. Make the contribution to the world that only you can make-and enjoy the abundance you’ll receive in return. Now you can turn yesterday’s priceless wisdom into tomorrow’s boundless rewards.